The good news was that the 67 lens worked well. Since it was a "new" setup - there was a need to do a lot of work to gather data. For example, the lens needed to be checked to see if it could be brought to focus. This meant setting up the @focus2 routine. Then plate solving needed to be setup. Since the lens is bright at F4, there were a lot of stars seen during a short exposure. So many that the plate solve software that they all were noise. Once it was tweaked properly, then it was time to move on to the guide camera. Focusing the guider wasn't too hard, as I could easily blow up the image window on TheSkyX so that I could see it from a few feet away. All of these tasks consumed much of the first night once I'd polar aligned two other mounts. 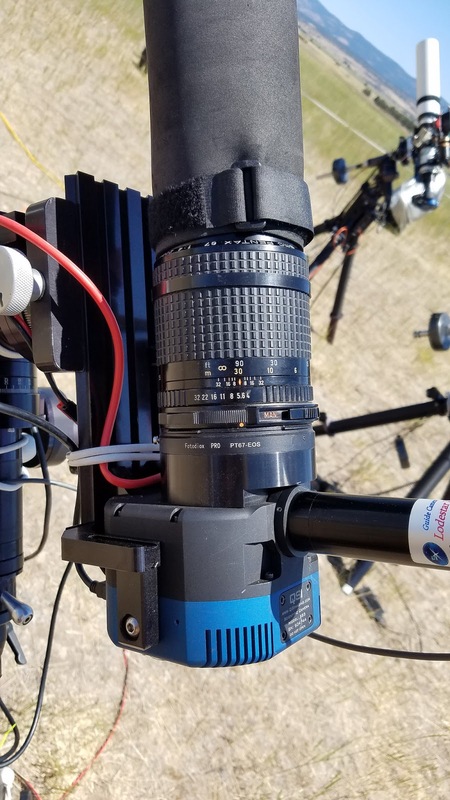 The final challenge was to calibrate guiding so that CCDAutopilot could initialize. This was a real puzzler. 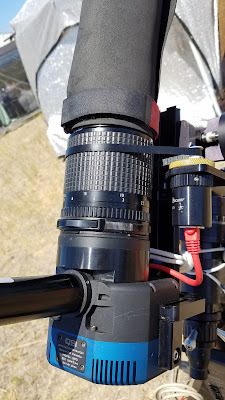 I found that every time I connected the Autoguider ST4 cable to the Lodestar, it would drop off Windows with a USB error. The only way to bring back the camera was to pull it off the mount and directly connect it to the laptop. This seemed to be a voltage issue at first, so I ran a new power drop just for this last mount. However, this did not solve the problem. Then I considered that maybe it was because there was a long USB cable to the hub without using a USB repeater like the other mounts use. While this may yet be the final solution, I didn't have another repeater to test. In the end, I forced TSX to use pulseguide instead of using relays to control the mount. By this point, much of the first night was gone and it was time to get some rest. The coming nights, I was able to get CCDAutopilot to start gathering data. In looking at the information collected, when the system worked, everything looks great! The challenge is that the system spent a huge amount of time thrashing about with platesolves and focusing instead of getting data. This may be because the local temperature was dropping so fast that it couldn't keep up. 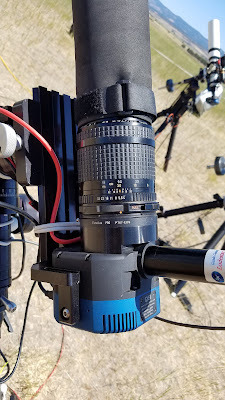 In looking at these temperature and focus point measurements, I can see that the lens does seem to have pretty strong sensitivity to shifts as the air cools. It might be best to consider putting a dew heater on it help with keeping it stable. The above is 10 minutes at F4 through the R filter. The below is the view of this sub, highlighting the center and the corners.